Raja Ampat diving will spoil you with some of the most pristine and varied biodiversity in the world. Having heard about this spectacular wonderland while gorilla trekking in Rwanda in 2007, it’s been on our bucket list ever since. After descending into warm, sun dappled water, you’ll alternate between admiring magnificent reefscapes, floating beneath enormous oceanic mantas and searching for rice-sized pygmy seahorses on massive sea fans. 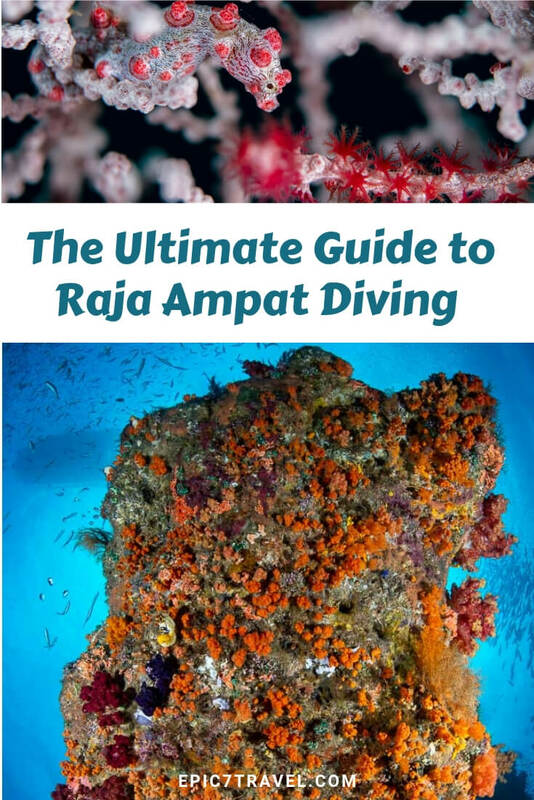 Read on to learn about the best dive sites and operators, the unique underwater life you’ll encounter when you dive in Raja Ampat, and when and how to plan a trip. While indulging in world-class scuba diving in Raja Ampat or snorkeling amongst the rock island karsts, you will marvel at the untouched beauty both above and underwater. Floating through crystal clear turquoise lagoons surrounded by razor sharp volcanic pinnacles feels as if you’ve stepped into “The Land of the Lost.” The mushroom shaped islands resemble Palau, another of my favorite world-class diving destinations. Wondering what are the best places in the world to scuba dive? Raja Ampat now ranks as one of our favorite places to scuba dive along with Palau, Papua New Guinea, Komodo, Socorro, Anilao and Lembeh Strait. The fish life, colors and diversity are the best we have experienced anywhere in the world. We loved the mix of big and small critters. 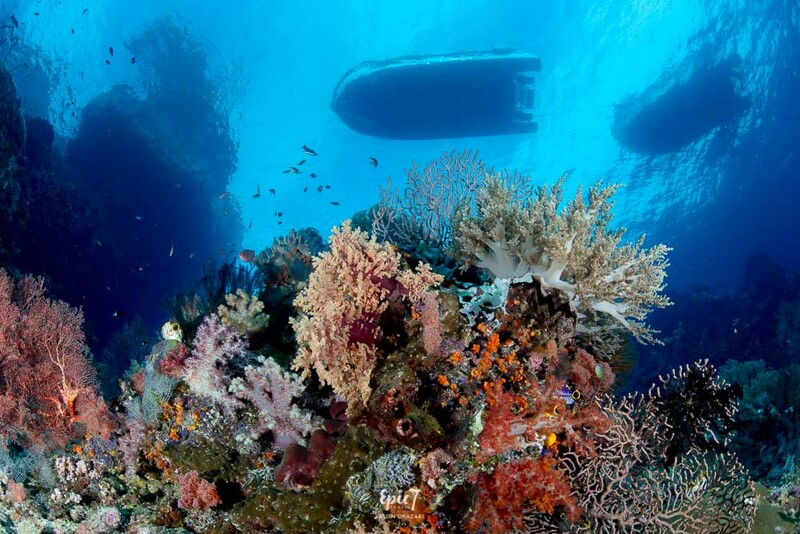 Raja Ampat liveaboard versus dive resort? 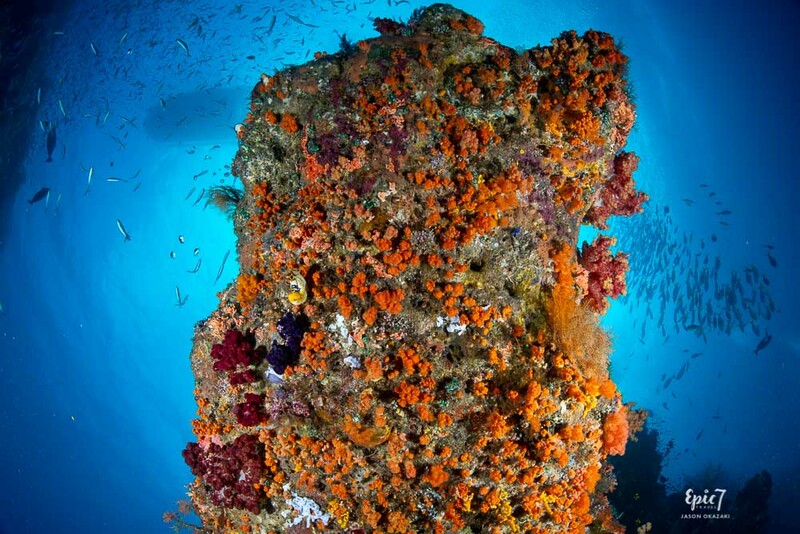 If you are game, I highly recommend opting for a liveaboard dive boat. This will not only maximize your time, but also the diversity of what you will see. In addition to avoiding congestion at popular sites, you’ll explore remote areas in Northern and Southern Raja Ampat. During our 36 dives aboard the Damai I, we only encountered other divers twice. TIP: I highly recommend exploring the brilliant underwater world with an 11-day trip on Damai. We really enjoyed the Triton Bay to Raja Ampat itinerary. 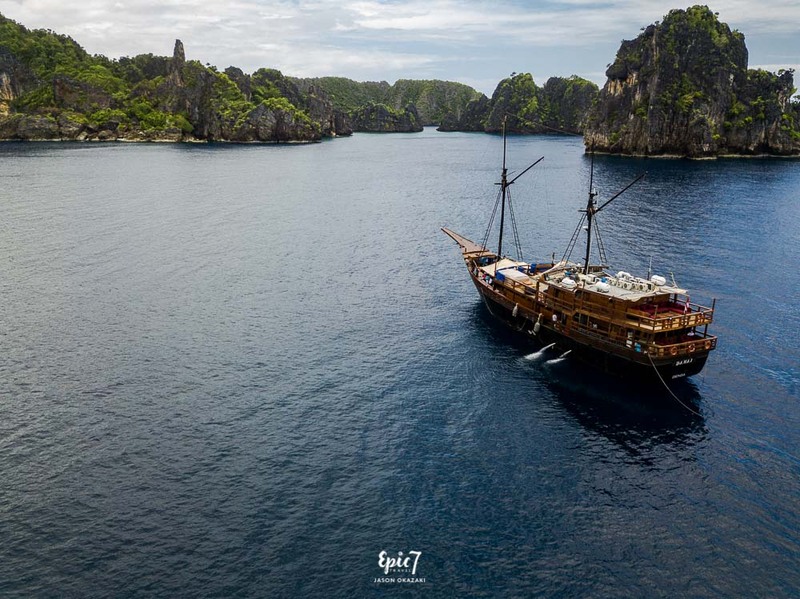 Sailing this remote island archipelago on a luxurious, Indonesian Phinisi, with eagle eyed dive guides, elevates this bucket list experience. We plan to return and spend even more time exploring the north next time! Prepare to be hypnotized by Raja Ampat’s explosive colors and enormous shimmering fish schools surrounding you as sun rays dance through the water column. Raja Ampat means “Four Kings,” named for the four main islands in this West Papua province, Misool, Salawati, Batanta, and Waigeo. 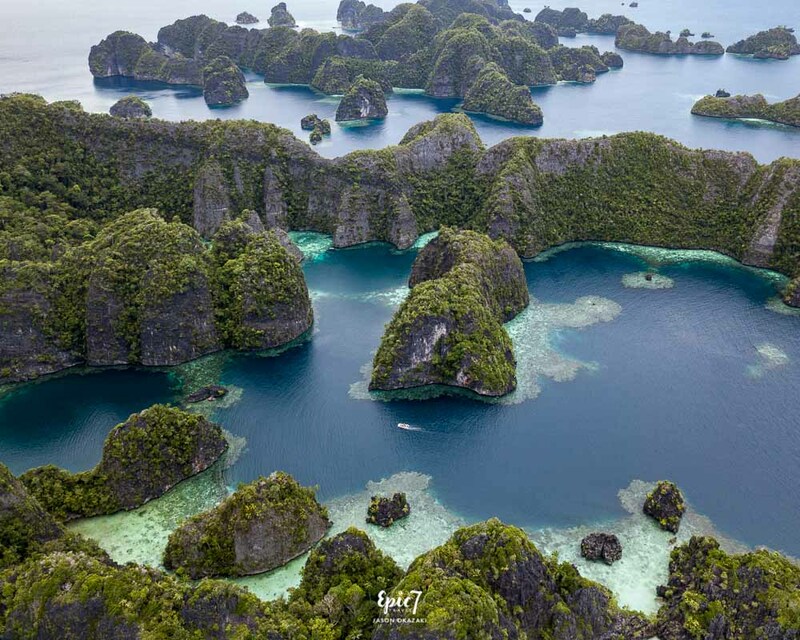 The biodiversity is a result of Raja Ampat residing in an area where two tectonic plates separated millions of years ago. Established as a Marine Protected Area in 2010, it’s a privilege to see the difference that can be made in only a decade. Sharks, napoleon wrasse, barracuda, and humphead parrot fish patrol the slopes and reefs, with batfish schools meandering around in the shallow areas during safety stops. Fortunately, the nocturnal epaulette/walking shark endemic to Raja Ampat allowed Misool Eco Resort to seek protection for the Marine Park, ultimately expanding the protected area to 1220 square kilometers/758 miles. Shifting the locals’ livelihood from fishing reef sharks, mantas and whales to serving as their defenders has proven incredibly beneficial for their families as well as the area’s marine life and tourism. 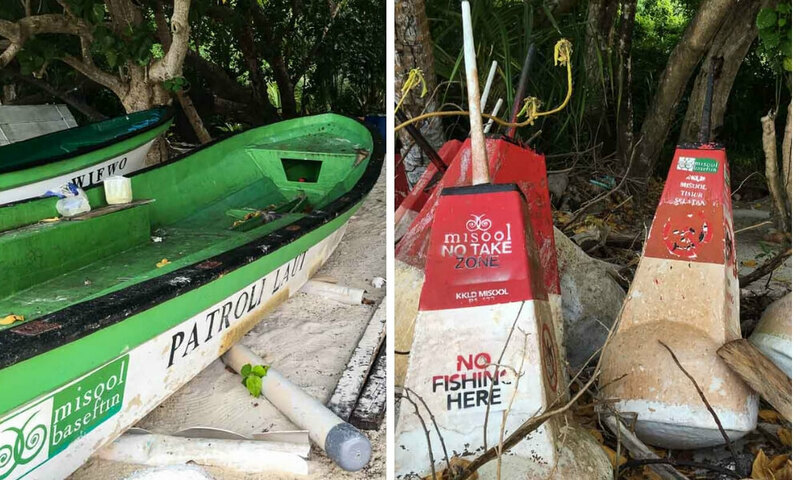 If fishermen violate the no take zone, repercussions include arrest, fines and the fishing boat being set afire and sunk. This loud and clear message serves to deter other potential offenders. 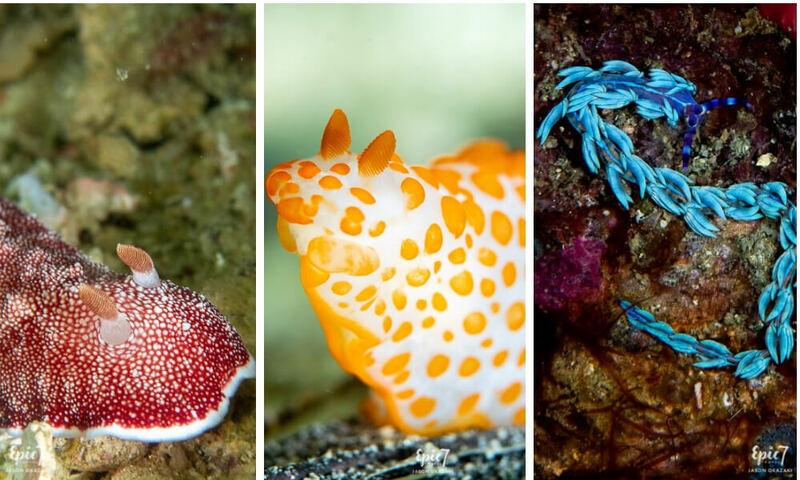 What kinds of sea life do you encounter when diving in Raja Ampat? Entering the water and being greeted by a manta ray, much less a giant oceanic one, is a dream come true for any scuba diver. While diving in Raja Ampat at Blue Magic, we had the privilege of rolling in and immediately encountering a beauty with a 20-foot wingspan, checking us all out before banking away. During the next hour, we found ourselves swiveling our heads as dive guides continually banged their tanks, pointed into the murky waters, and hooted into their regulators, signaling the arrival of yet another manta. With six mantas circling, we’d be staring one in the face as another snuck up behind us and hovered above our heads. Encountering a predominantly white manta during this dive astounded us all as it seemed to gracefully glow in the distance. Refraining from chasing mantas and not blocking their path to the cleaning stations often results in mantas curiously circling back to check out divers. A black tip shark zipping past, an octopus feeling its way along the rocky outcroppings and schooling fish swarming us complemented this memorable Raja Ampat dive. 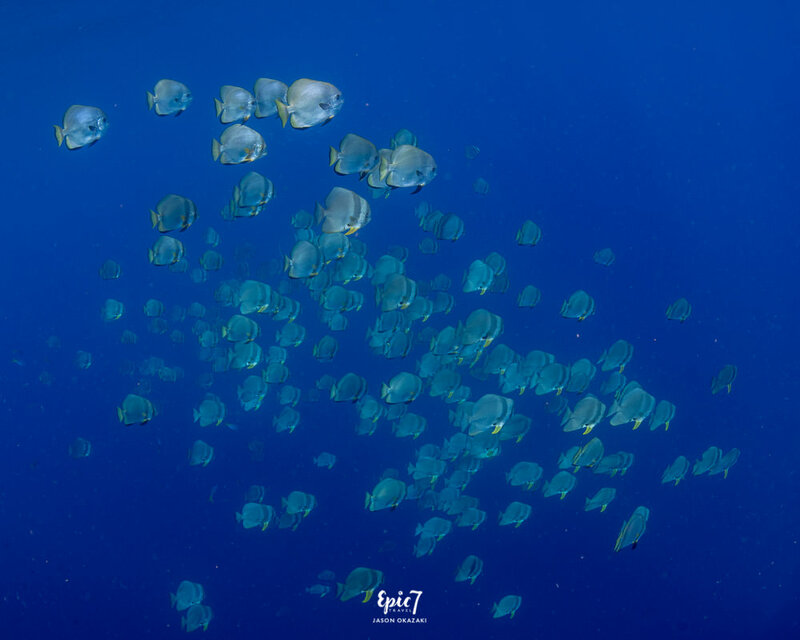 At times, I found myself gently waving my hand to disperse the “wall” of fish surrounding me, obscuring my view of the mantas. What a unique “problem” to have! 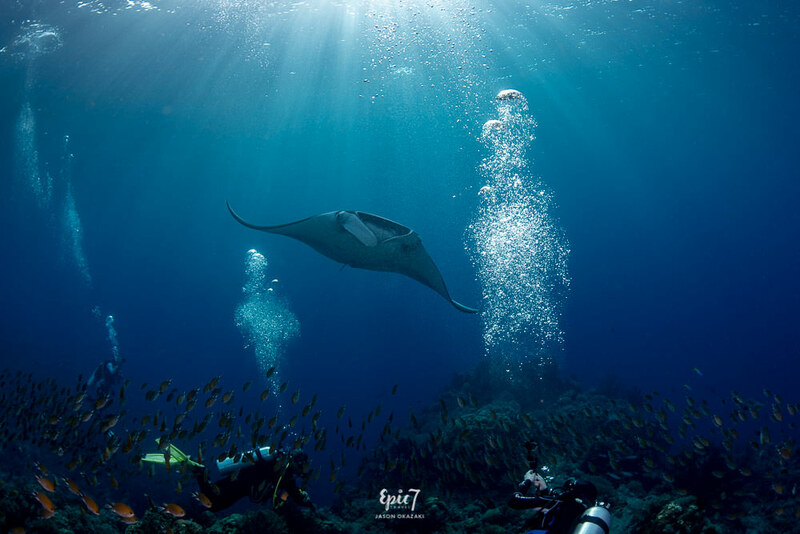 TIP: February – May is manta season in Raja Ampat. While manta rays are reliably found at Blue Magic & Magic Mountain, they are also seen at other dive sites during this peak time. TIP: Apparently, mantas like to see your eyes. So, hold your camera down low, allowing them to see your face, which often tempts them to come in for a closer look. Framing Raja Ampat’s kaleidoscopic soft corals and enormous sea fans swaying in the currents with a sunburst and boat silhouette above makes for a stunning wide-angle shot. While I knew the area is renowned for this quality, I didn’t realize this would result in innumerable pygmy seahorse encounters. After one diver on our trip remarked “Just wait, you’ll be pygmied out by the end of the trip, ” I laughed aloud and thought “bring it on.” I could never tire of watching these miraculous mini dragon-like critters beat their tiny “wings” as they breathe through their little snouts with their facile tails wrapped around a fan, shyly turning their backs to you. 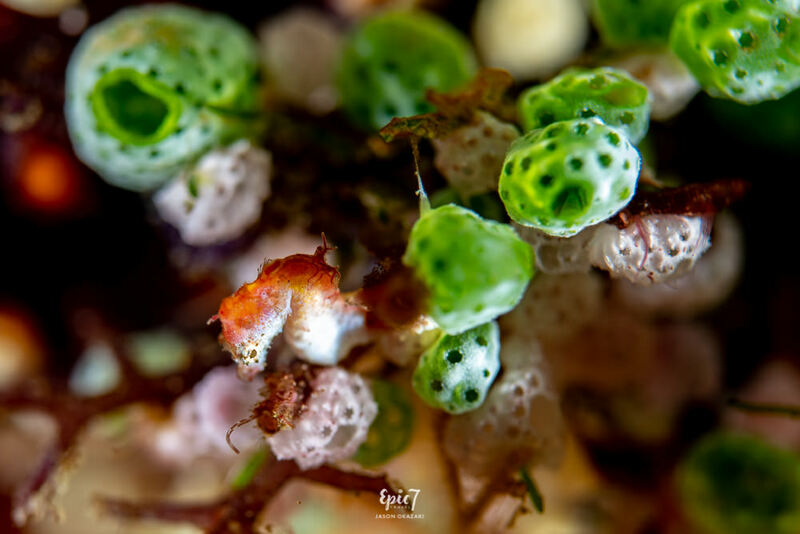 Having only seen pygmy seahorses on a few dives in Indonesia and the Philippines before, we discovered two new types on this trip – Pontohi & Gusti. You will be amazed when your dive guides find these masterfully camouflaged critters hitched onto ornate sea fans or hanging under ledges amongst algae. It’s funny how I now think the one inch sized Hippocampus Bargibanti seahorses are “big” (2cm/.79 inches) after marveling at the rice sized Pontohi (1.7cm/.66 inches), Denise (2.4cm/.94 inches) and Gusti pygmy seahorse cousins. During the trip, our EXTREMELY adept guides discovered four different sea fans with 10-15 hippocampus Bargibantis inhabiting one fan – what a treat to see! Our dive guide, Gusti, discovered the Gusti pgymy seahorse many years ago – now my new favorite! 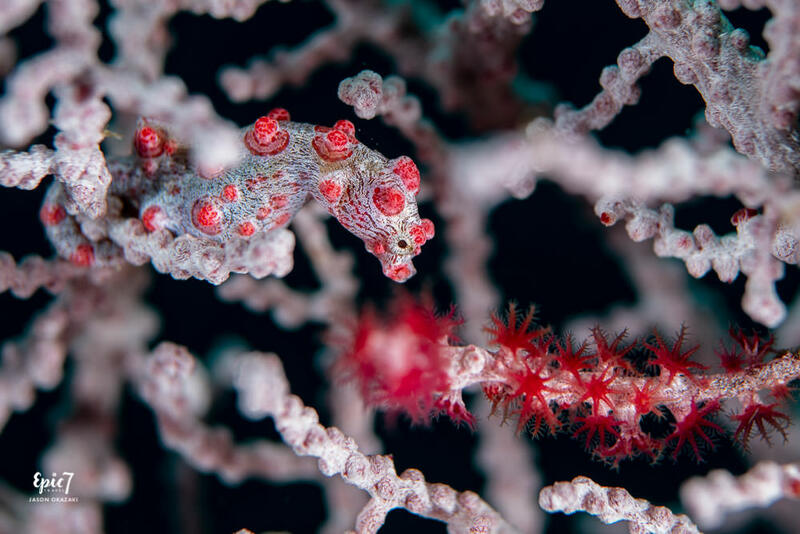 Our legendary dive guide, Gusti, who has been diving the area for 25 years, discovered the picturesque red Gusti seahorses covered in white “pom poms” years ago. TIP: While admiring their adorable little faces, look closely for a bulbous belly, signaling you’ve found a pregnant male. Gestation is very short – only two weeks. Floating weightlessly in front of the fans and watching their acrobatics and amusing antics is enchanting. Launching themselves from one coral branch, pirouetting through the water column, they gracefully wrap their tails around the next branch, reminding me of kangaroos as they “jump” around. In one instance, a pregnant Hippocampus Bargibanti male sailed through the water, using another pygmy as its anchor point. After rubbing noses with that pygmy, readjusting and shifting sideways, it faced the opposite direction, providing a lovely mirror image memory. 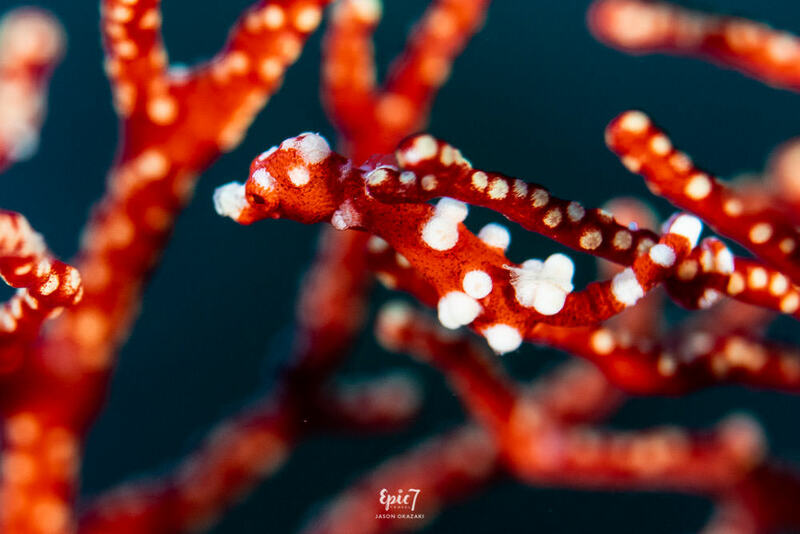 TIP: To try to independently discover these tiny critters, carefully examine clean red sea fans as pygmy seahorses prefer those to ones covered in algae. 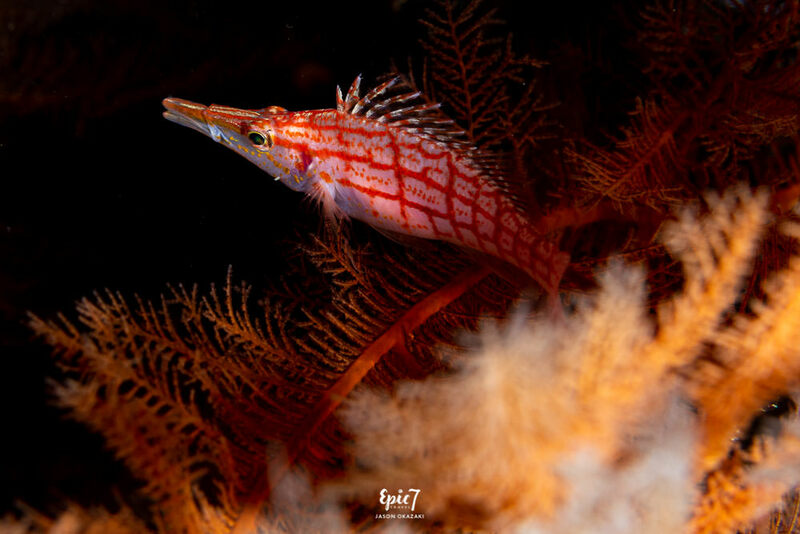 If a hawkfish is lurking about, you won’t find pygmies as the hawkfish will have already gobbled them up. Be aware that spotting Pontohi seahorses on your own is next to impossible. Finding rice sized creatures hiding amongst algae is more challenging than any eye exam. For size reference, they are the size of a capital “P” in 12 size font. Absolutely tiny! Diving in and being greeted by hundreds of schooling batfish made me smile. After having my mask fog repeatedly, a mask strap snap, my mask break, a Go Pro and weight pocket accidentally dropped overboard and my regulator mouthpiece break all within a 24-hour period, I found myself extremely grateful for Mother Nature’s gift. Concentrating on huddling together and synchronized swimming, they seemed oblivious to the bubble blowing divers floating amongst them and snapping images of their gorgeous formation. Spending time amongst tantalizing, kaleidoscopic colors as fearless fusilier fish surround you is meditative. Watching symbiosis play out as larger fish hover in place and open their mouths to signal smaller wrasse to clean them and delicately nip the accumulated pesky parasites is fascinating. Did you know? 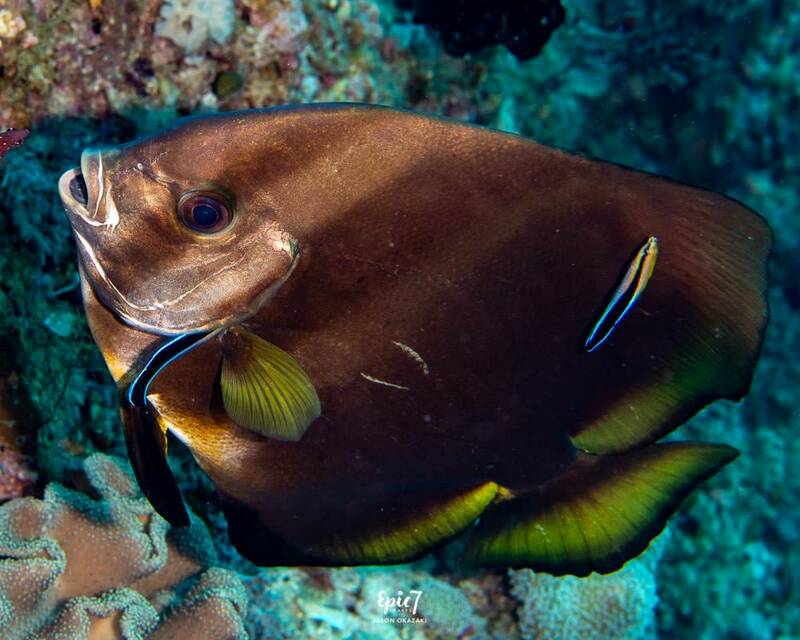 Cleaner fish not only always have stripes but they also wiggle and dance as a way to calm their larger “friends” and entice them to partake in a cleaning. While being cleaned, the larger fish change colors to show their tiny assistants where to focus and remove things. 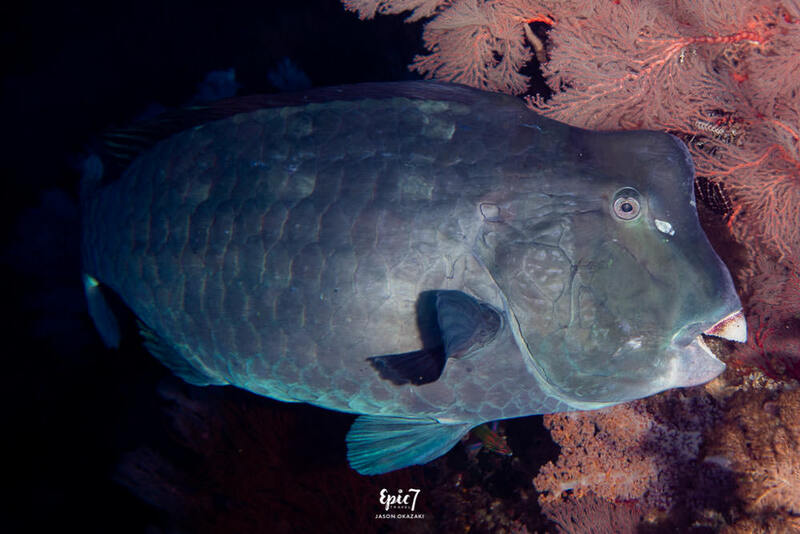 At one point, I found myself laughing into my regulator as a persistent remora kept trying to hitch a ride on an unreceptive Humphead Parrotfish. Watching it pivoting and dragging its body along the sandy bottom trying to detach the unwanted hanger on made me realize they detest them as much as divers do. TIP: To deter remoras from seeking you out and attaching to your bare legs as one tried to do to one unsuspecting diver on our trip, wear a full wetsuit rather than a shorty. Fair warning – they’ve been known to attach to wetsuits as well. 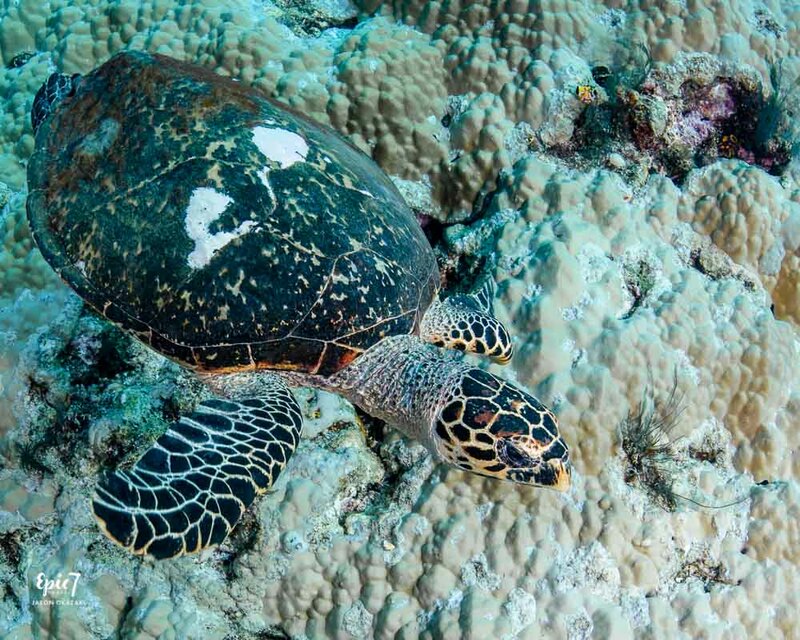 Make sure to look behind and above you for sea turtles heading to the surface for a breath or chomping on coral. Given that only 1 in 1000 survive to adulthood, it’s always a privilege to see a massive Green or juvenile Hawksbill turtle. Since they provide one dive guide for every four divers and allow unlimited bottom time (within no decompression limits), it provides you the flexibility to remain underwater for 70 minutes or more enjoying the show. Kitting up for dives is unparalleled. As you are shimmying into your wetsuit, someone will offer to help slip it over your leg, pull it up and then zip it. Greeting guests with a tasty juice with a glass straw. Giving a reusable cup with your name to use throughout the trip. Providing palm oil free lemongrass scented shower gel, shampoo, conditioner, hand soap and body lotion. 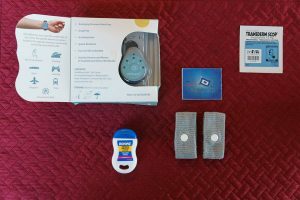 Using refillable containers minimizes plastic waste. Changing sheets and towels only once per trip if you prefer. Selling repurposed silver jewelry from Bali’s Burana Silver. I love the pygmy seahorse earrings I purchased. Photo/video backups are key – Make sure to back up memory cards to a computer and/or hard drive each night. After our GoPro was accidentally dropped overboard, we were thankful we had downloaded our coveted whale shark footage. I would have been absolutely devastated if we’d lost these unique memories. Masks do break – After 23 years and 350 dives, my mask strap snapped. Although I travel with backup fin straps and a backup mask, I don’t bring an extra mask strap. After replacing the strap, the side of my mask broke off enroute to a dive site. This forced me to use my back up mask. Regulator mouthpieces break too – The very next day my mouthpiece felt loose and I realized I’d bitten through part of it. Fortunately, I travel with a backup for that too. It lasted me for 300 dives over 11 years, so I’d say it did ok.
For 82-84F/28-29 C water temperatures, a 3mm full wetsuit works fine – Since I get cold easily, I always go with a 5mm to stay toasty. Carry a Surface Marker Buoy (SMB) – Since currents can be strong, this ensures tender boat drivers can easily find you. 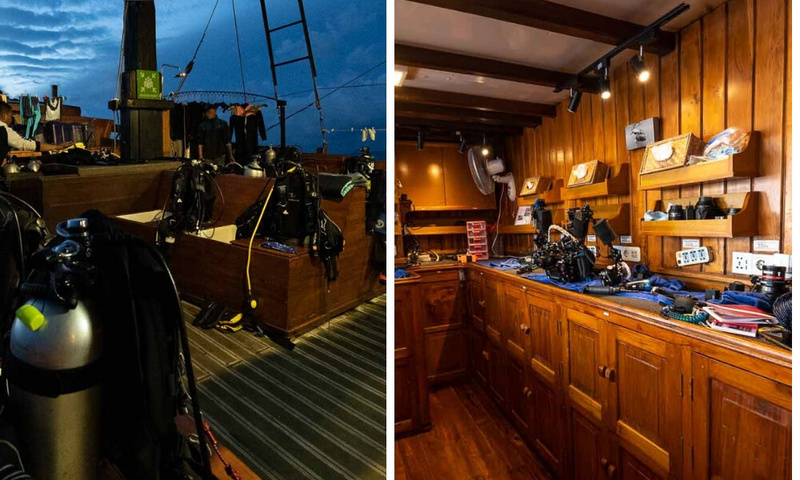 Liveaboard prices typically range $250-$500 per person per day, which includes all food, accommodation and diving. To ensure that space is available for your desired trip timing, book early. We typically book liveaboards one to three years in advance! TIP: I recommend bringing at least 10% of your trip cost in cash for tipping. The cruise director will split the tip equally amongst the staff at the end of the trip. 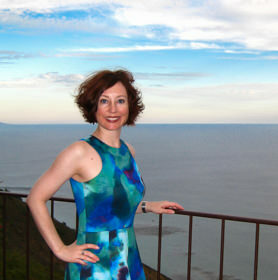 The team works extremely hard (typically 15 hour days) to make sure you have a great trip. 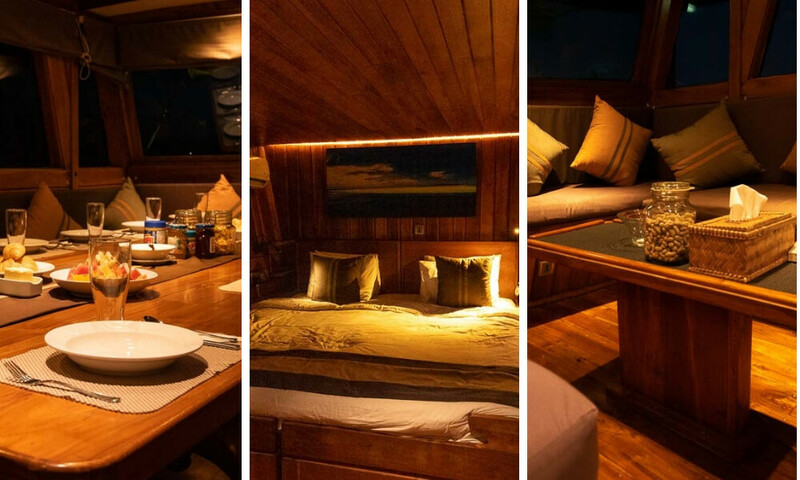 Indo Siren – Luxury wooden Phinisi boat that hosts 16 divers. We’ve dove with the Siren Fleet in Palau and Komodo and highly recommend them! Wondering about good Raja Ampat dive resorts? Misool Eco Resort 7, 9 or 12 night stays are offered on a fixed schedule. Friends who have stayed here have raved about the resort. Due to the South Monsoon, the property is closed from early June to late September. Kayak4conservation – Support local homestays while kayaking through the Raja Ampat islands and mangrove forests. Travel between villages, exploring hidden rivers and caves while snorkeling on the surrounding reefs. 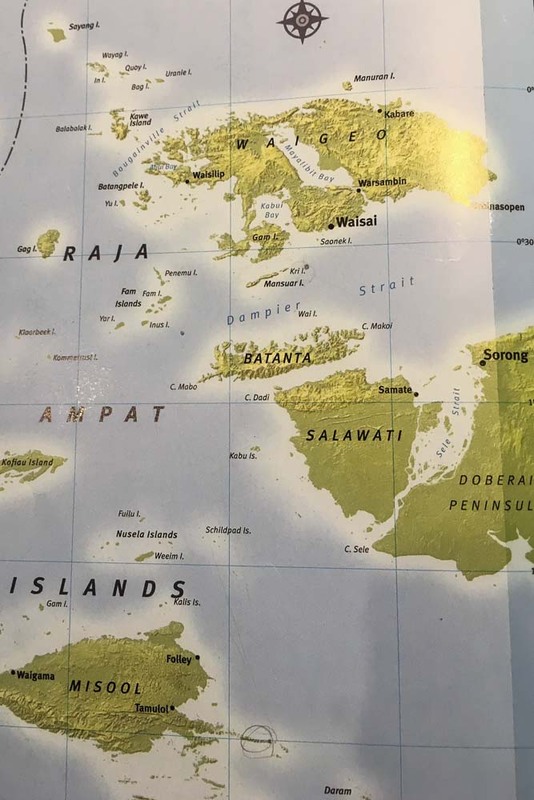 Is Raja Ampat suitable for beginner divers? We had mild to non-existent currents on most of our dives. The medium currents we had on two dives were very manageable. We had a diver with only 30 dives onboard who had no issues throughout the trip. Since currents can be strong due to tidal shift and moon phase, your dive guides will assess before each dive. If conditions are too rough, they will likely change the dive site. Given that down currents can occur, having good buoyancy control is key. Telltale signs for a down current are: 1) your bubbles flowing downwards 2) fish facing upwards and swimming in place. TIP: To manage a down current, first swim horizontally away from the flow/wall (parallel to the ocean bottom). If you still keep descending, add air to your buoyancy compensator device (BCD). Once you escape the down current, deflate your BCD to ensure a controlled ascent to the surface. Only drop your weights as a last resort. October – April. Due to the Southern Monsoon season, most operators leave the area from May – September. 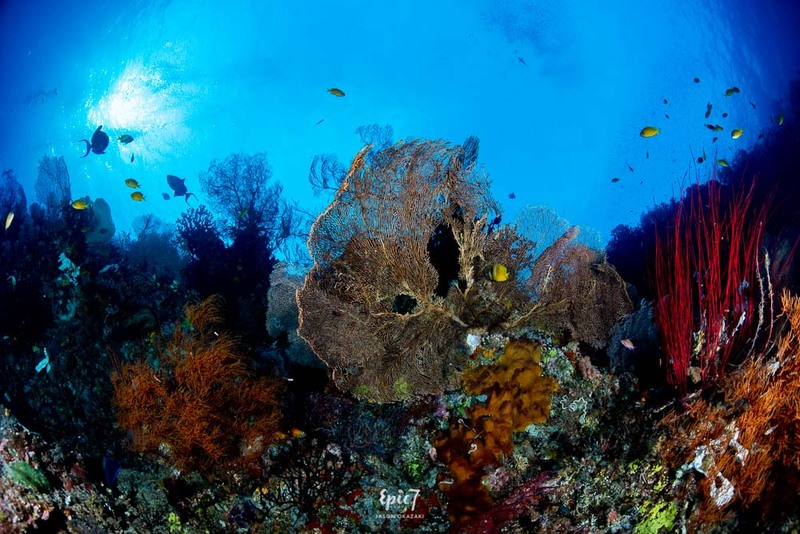 Southern Raja Ampat diving, particularly Misool, is impossible during this time due to sea conditions. It’s really remote: Be prepared for extensive travel to reach Raja Ampat. As a result, it’s remained pristine. From San Francisco, it took us 48 hours and 4 flights. 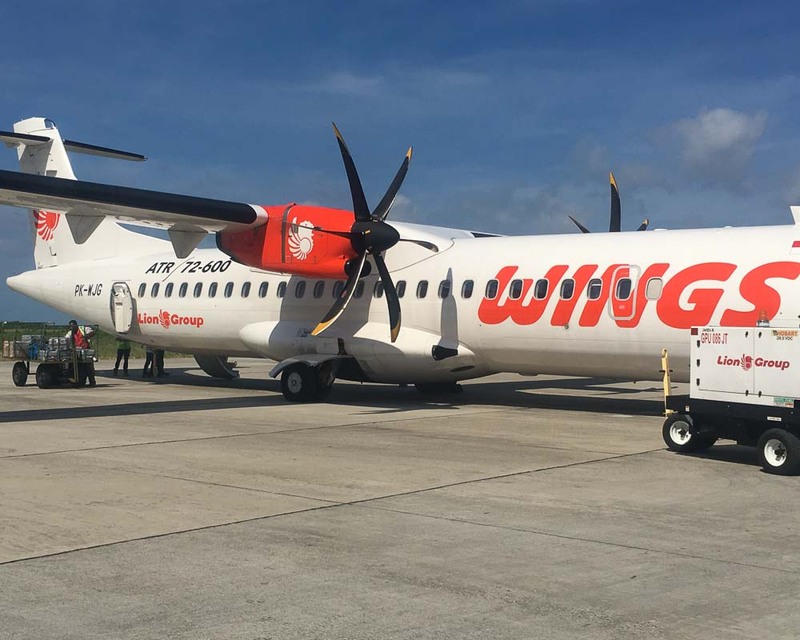 Fly from Jakarta (CGK), Manado or Bali on Lion Air, Garuda, Wings Air or Batik Air to Sorong (SOQ). Daily departures are offered with a plane change in Makassar (UPG). Or, fly to Waisai on the island of Waigeo. Book via Nusatrip. Since we started in Triton Bay, we then connected to Kaimana to meet our liveaboard there. Raja Ampat liveaboards depart from the Sorong port. Baggage limits: Most domestic airlines enforce a strict 20kg/40 lbs checked bag limit. They will charge you $8USD/14200 Indonesian Rupiah per kilo over. You will pay this separately after you check in at the airline office with Indonesian Rupiah or credit card. TIP: If you are traveling with someone, one should check in while the other stays back with the carryon bags. Make sure to have six months remaining on your passport. A 30 day tourist visa stamp will be issued on arrival. Since domestic flights don’t depart every day, arrive a day early to ensure your luggage arrives and stay at the Jakarta Bandara Accor hotel, which you can book via booking.com. The hotel offers ala carte or buffet breakfast, lunch and dinner. Highlights include soursop or mango smoothies, tempeh, French toast and nasi goreng (fried rice with egg). Relax at the pool, indulge in a Balinese massage or hang out in the steam room or sauna. Wow what an amazing underwater world! Your vivid descriptions combined with the artistic photography have helped me understand a place I will probably never explore but would love to! 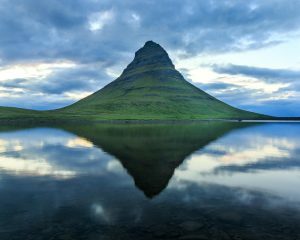 This post is rich with insights and helpful tips for those who decide to add this destination to the list! Thanks, Kavita. The underwater world is really astounding. It’s such a privilege to experience all of Mother Nature’s beauty from a different perspective. 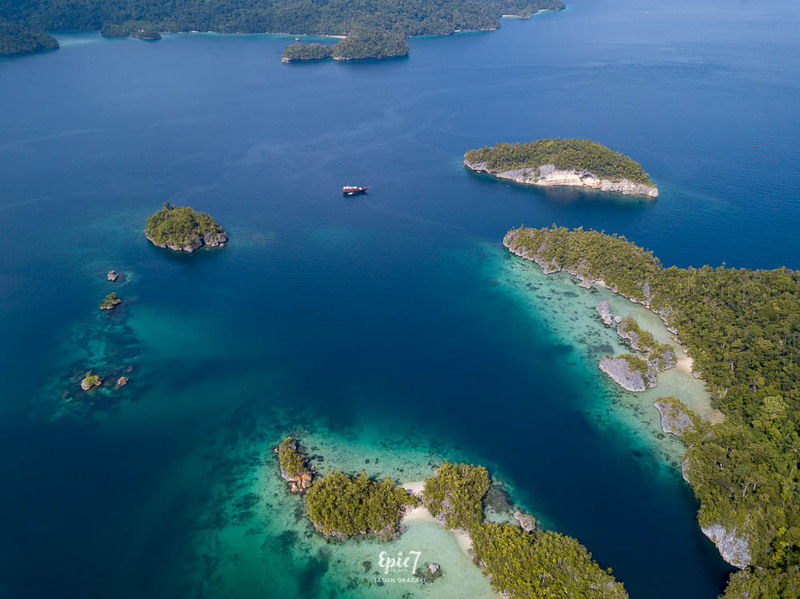 Raja Ampat is definitely a bucket list worthy destination for those interested in exploring a beautifully preserved and untouched part of our world. Thanks so much for this amazing post!! 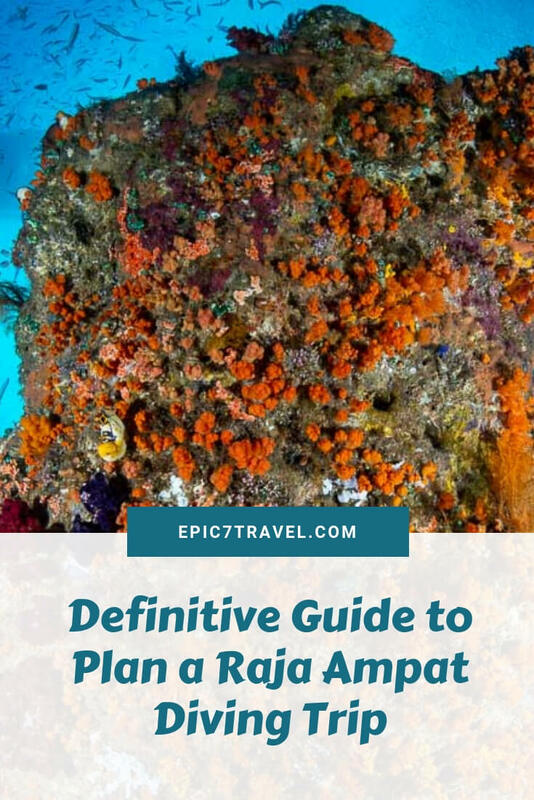 We would love to visit Raja Ampat—this is the perfect trip planning guide!! I’m so glad you enjoyed the article, Linda. I highly recommend Raja Ampat – definitely one of the most pristine places that we’ve had the privilege of visiting and scuba diving. I hope you make it there someday soon!